Osama Bin Javaid's Blog | I think out so loud, it becomes black and white! What’s in a name? Well, if you’re not careful it can cause fissures in alliances, potentially cost billions in aid and result in mass confusion. The much awaited declaration of the Taliban office in Doha, Qatar, was welcomed across the globe as a move that will pave way for peace in war-ravaged Afghanistan. Yet Afghanistan wasn’t among the countries cheering the fighters’ arrival at a formal negotiating table. President Hamid Karzai took exception to the use of the term “Islamic Emirate of Afghanistan” – a name which reminds Afghans of the days when the Taliban was in charge and which was not cleared with the Taliban’s Qatari hosts. Qatar’s state news agency clarified that the agreement was to open a political office of the Taliban, not that of the Islamic Emirate of Afghanistan. Karzai hit out not only at the Taliban but also at the US and suspended security talks, blaming foreigners interested in advancing only their own strategies and goals. Within hours, his threat seemed to have worked. US secretary of State John Kerry has had to pick up the phone more than once to assure Karzai that the Afghan government was not being sidelined. 1. To talk and improve relations with the international community through mutual understanding. 2. To back such a political and peaceful solution which ends the occupation of Afghanistan, establishes an independent Islamic government and brings true security which is the demand and genuine aspiration of the entire nation. 3. To have meetings with Afghans in due appropriate time. 4.To establish contact with the United Nations, international and regional organizations and non-governmental institutions. 5.To give political statements to the media on the ongoing political situation. Taken together, they appear like a bold outline for future power-sharing in Afghanistan – and, therefore, objectionable to the authorities in Kabul. The Karzai government also wants the talks to happen directly without any interlocutors such Pakistan, which played its part in the establishment of the Doha office by freeing Taliban prisoners and allowing others to travel freely to Qatar. What is noteworthy is that that the Doha office hosts no decision makers but just intermediaries between the Taliban supreme council, the Afghan government and the Americans. As far as the Taliban officials are concerned, they see the latest development as a victory of sorts. After the fall of their government in Afghanistan in 2001, this would be the first open, official acknowledgement of the group’s power base. The Taliban’s progress naturally poses a diplomatic challenge for the Karzai government. It’s a unique case of one country having two representative offices in a foreign country (an embassy and a Taliban political office). The Afghan government has to walk a fine line in making sure that its diplomats are relevant in the presence of an influential force capable of affecting the situation at home. The Taliban does not recognise the Afghan government’s power to veto or amend its decisions. But the group must realise that it cannot wage war and talk peace at the same time for the sake of credibility. US forces invaded Afghanistan and toppled the Taliban goverment because the group failed to sever its links with al-Qaeda, then operating from Afghan soil, in the aftermath of the September 11, 1001, attacks. Although a Taliban official has said the group does not wish to harm other countries, it has to work hard to dispel international scepticism. Meanwhile, members of the Afghan expatriate community in Qatar say they have been deceived by so many sides on so many fronts that they don’t know who to trust. A businessmen told me: “We want peace at any cost and whoever can bring it. Our generations has suffered from the fighting. 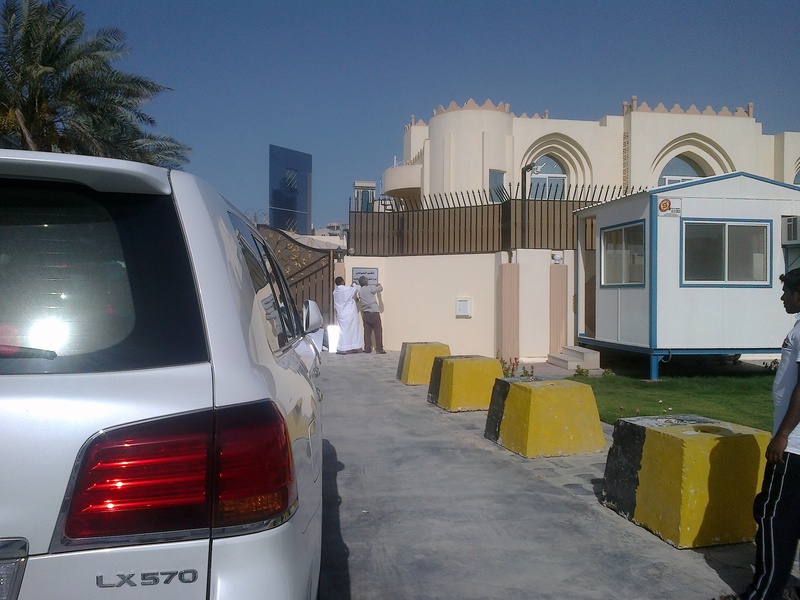 On Wednesday night, the policemen on guard outside the Doha villa at the centre of international attention said the Taliban office would open in the morning. US officials have apparently assured the Karzai government that the plaque bearing the words “Islamic Emirate of Afghanistan”, to which it had taken offence, would be removed. Howsoever shaky and tentative, peace, it would seem, has been given a sliver of chance in war-weary Afghanistan. Plaques on buildings can be taken off or be put put back on but this shaky and cautious peace process does offer some ‘hope’ – a commodity not abundant when it comes to Afghanistan after 2014. “I want to thank and express the appreciation of President Obama and all of us working on this issue for Qatar’s willingness to host the Taliban office here in Doha in order to facilitate negotiations between the Afghan High Peace Council and the authorized representatives of the Taliban. Now it is obvious from just the early churning around the opening of that office that nothing comes easily in this endeavor, and we understand that. And the road ahead will be difficult, no question about it, if there is a road ahead. Clearly there’s been a challenge thus far, but I want to thank our friends in Qatar for having made the effort, having reached out, having gotten far enough to at least have an announcement made that there is an office. And it is our hope that this could ultimately be an important step in reconciliation if it’s possible. We know that that – it may well not be possible, and it’s really up to the Taliban to make that choice. The High Peace Council is ready, the United States is ready, the Qataris are ready; all of them have lived up to their obligations thus far, and it remains to be seen in this very first test whether or not the Taliban are prepared to do their part. Afghan official in Doha said to me ..
“- We (the embassy in Doha) have not been informed about any talks which may happen tonight or later. – U.S. officials have not informed us about the arrival of James Dobbins, we’re not aware if they have had any direct contact with the foreign office in Kabul. – We are not opposed to them talking BUT peace in Afghanistan HAS to be Afghan led. We are willing to talk but in the light of recent events we have not yet agreed to having a meeting with the Americans. Internal consultations are continuing about the scope of negotiations(in Doha and in Afghanistan). This process will take time and we are hopeful that a solution can be worked out in due time. Why do you ask us for a ceasefire as a precondition for talks? The Americans havent ceased fire, they havent left Afghanistan – this will take time. Important thing is to bring peace to Afghanistan and get rid of foreigners occupying our land. Tagged with: Afghan group's political office in Qatar has stirred peace hopes and a diplomatic storm.